Need new couch cushion covers? No problem, they're readily available in stores and online, or you can try making your own. When it comes to replacement sofa cushions there are a lot of options. Making couch cushion covers is a fairly straightforward sewing project. If you're going to do it there are a few things to remember. Measure the existing cushions using a flexible sewing measuring tape. Make sure to measure the height, length and width of the cushions. Always double check your measurements to be sure you've got it right. Determine the amount of fabric needed. Bring all of the measurements with you when you go to purchase it, and consult someone in the store to make sure you're getting the right amount. Consider buying a little extra to make sure you have enough, and in case you want to make a couple of extra throw pillows. Be sure to choose a fabric that either matches or is complementary to the rest of the sofa and room, and that suits your lifestyle. Purchase any thread, zippers, and extra embellishments that you may need. Before starting be sure to wash and dry the fabric in case there's any shrinkage. Use the original cushion as a pattern. Place the new fabric on a smooth surface, wrong side up, and put the cushion on top of it. Draw around it with a fabric marker adding a little extra room (an inch or two), which will allow for seams. Sew the three front sides of the covers. The back portion will remain open to allow the cushion to be inserted. If you're not a great sewer, enlist the help of a friend who is. Make sure the material is the wrong side out when sewing. Use fabric pins to hold the material in place. Turn the cover right side out, and sew a closing method (a zipper is the most practical) on the backside. Put the cushion inside, close up the zipper, and place the cushion back on the couch. The above is the most basic method to make a cover for a couch cushion. There are many ways to give it a more tailored and fitted look, including adding welting and trim. An accomplished sewer can easily do these things, but if you're not up to the job it might be best to take it to a professional. Because the job isn't too complicated, the cost shouldn't be too high. 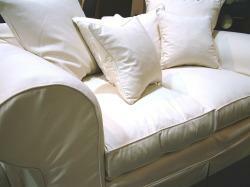 Depending on the size of the cushions, you can either purchase ready made slipcovers, or you can have them custom made. If you decide to go the custom route you can either consult an upholsterer in your area, or find a company that allows you to order online. There's an unending number of websites that offer this service. If you decide to order couch cushion covers online make sure that you give the company the exact measurements and also check out their return policy in case there's a problem. Companies that do custom work don't always offer returns, so check them out beforehand. You should also check with the manufacturer of your sofa to see if they sell replacement cushion covers. If they do it will save you the stress and headaches of trying to replace them elsewhere. When it comes to couch cushions remember to keep them fairly simple. Because sofa cushions take a lot of abuse it's best not to add too many embellishments. Use a durable fabric that suits your lifestyle and needs and keep the style fairly simple. Don't add buttons, sequins, or any other embellishments that can catch on clothes. Save those for the accent pillows. The most important thing to remember when making or purchasing sofa cushions (just like when purchasing a sofa) is to get ones that will suit the room and the lifestyle of the people using the sofa. If the couch is only occasionally used you can have a more delicate fabric, but if your sofa often has kids and pets jumping on it and food being spilled, you'll want a durable, stain-resistant fabric. Keep these things in mind when replacing cushion covers.